Yassin Raffay of Seminole State Cross-County finishes the race at Lakeland. Photo by Will Morris. 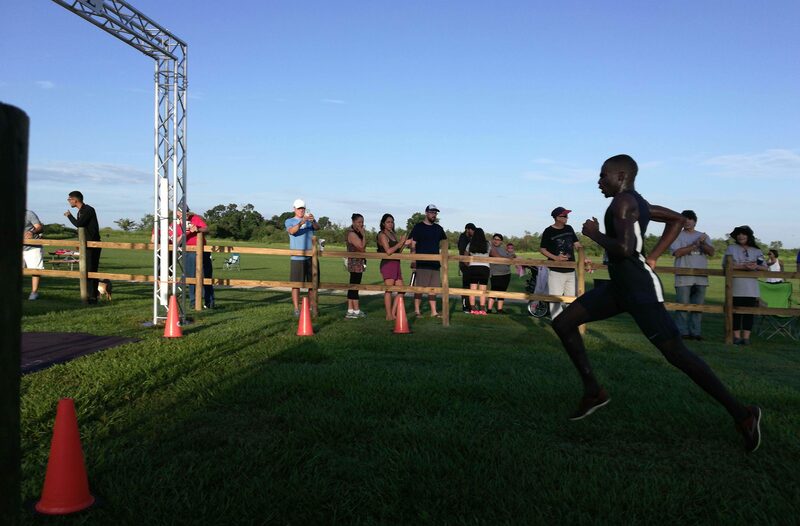 LAKELAND—The inaugural season for the Seminole State College cross-country team started with two of the three men finishing in the top 5 at the Halloway Park XC Preseason Festival here Sept. 1. The men’s team is still in the works with only three men. It takes five to tabulate a score. The women’s team does have five members, all of whom competed in Lakeland. Members of the team, which started three months ago, said they were excited to come out and compete for their first meet. No one, not even the coach, could have predicted how they would do. For the men, Yassin Raffay placed fourth and Hillary Kandie took fifth. Amari Douglas finished 50th. “Not too shabby for a first race,” Raffay said after the competition. Raffay is a freshman from North Sudan. The new cross-country coach, Octavius “Ocky” Clark, spoke about working with such a fresh group, but he said he’s had some practice. “This is not my first time doing it,” Clark said. He was the original coach to open the cross-country program at Winter Springs High School back in 1997. For the women, Sara Kopack was the first member to cross the finish line at 23rd, followed by Jaina Hawkins in 24th. Fancy Cheruyot came in at 31st, Abby Orlando at 41st, and Jamiee Leduc finished 45th. Leduc said it was “pretty frickin’ awesome” being part of this team. “Hopefully there will be more girls joining,” Leduc added. The running background varies for all members, but that didn’t seem to skew their connection as a team. Leduc said she just started running about two years ago. Clark talked about his recruitment strategy for a team that’s still building. The team has since competed in Jacksonville at the University of North Florida Invitational Sept. 7. The women’s team finished 9th out of 10 teams with Hawkins leading the raiders. She placed 36th overall and 7th in the NJCAA field. Kopack was 38th overall, Orlando 48th, Cheruyot 53rd, and Leduc 56th. For the men, Kandie placed 15th followed closely in 16th by Raffay. Douglas was 67th overall. The Seminole State cross-country teams will compete next at the Embry-Riddle Invitational in Daytona Beach this Saturday, Sept. 15 at 8 a.m.